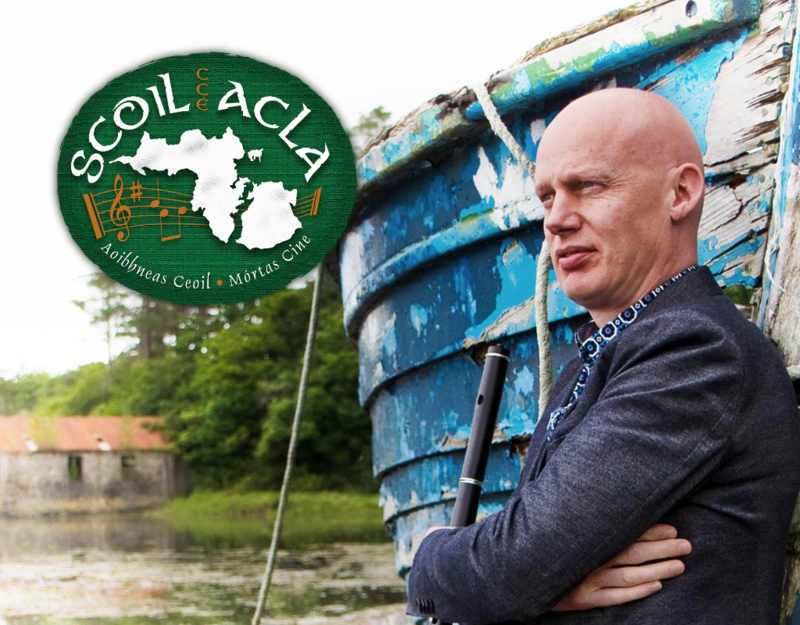 Scoil Acla CCÉ is delighted to announce Achill’s own – Des Cafferkey as Musician in Residence for Scoil Samhraidh Scoil Acla 2019. Des is a native of Crumpaun in Achill and is widely regarded as one of the finest exponents of the tin whistle and flute in Ireland, he is also an accomplished bagpiper who has been successful at a competitive level achieving All Ireland awards for senior tin whistle and bagpipes. Des along with co-founder Peter Carney launched the Westport-based Clew Bay Pipe Band (Banna Píob Chuan Modh) in 2012 where he continues to act as Pipe Major. He has performed with artists as diverse as Mundy, Damien Dempsey, Jack L, Pete Williams, Matt Molloy, Sister Sledge, Paul Brady, Mary Coughlan, Gerry O’ Connor, James Kilbane, Steve Cooney, Lúnasa, Laoise Kelly as well as the St. Laurence O’ Toole Pipe Band at Carnegie Hall. A composer and performer, Des is also a much sought after session musician and has recorded and toured with Imelda May on her Irish tour 2014, playing at Vicar St. and also Live At The Marquee, Cork where he accompanied Imelda on the song, ‘Tears of Clew Bay’. Des has three albums to his credit. ‘Achill Head’ which was released in 2009 featuring 13 tin whistle tracks and supported by some of Ireland’s top traditional musicians such as Tony Byrne on guitar, Tony ‘bodhrán’ Quinn and John Flatley on piano. His second album ‘Achill Air’ was released in 2012 and displays his talents as a composer by including four original pieces which sit comfortably alongside his unique treatment of traditional tracks on the album. ‘Trad with a Twist’ (2014) is a follow up to the two previous, highly successful albums. Guest artists on this album included Matt Molloy, Trevor Hutchinson, Shane McGowan, Laoise Kelly, Raphael Dziubinski, Bart de Boar, Kyle Dunleavy, Peter Browne, and The Clew Bay Pipe Band. The Scoil Acla Musician in Residence programme allows students to meet professional musicians in an informal setting to discuss all aspects of being a traditional musician and its role and function within our wider lifestyle. The aim is to illustrate and make students more aware of the wider context of the music which is being taught in class which reinforces and consolidates students’ interest in music. It encourages and compliments their interest, and in the longer term gives them confidence in pursuing their interest professionally or otherwise in their particular instrument. Past musicians who have taken up residency for Scoil Acla Summer School include John E. Lavelle, Joe Burke, John Carty, Liam O’Connor, Mary Bergin, Laoise Kelly, Catherine McEvoy, Micheál Ó’Raghallaigh, Mick O’Brien, Treasa Ní Cheannabháin, Breanndán Ó Beaglaoich, Eileen O’Brien, Kieran Hanrahan, Noreen O’Sullivan, Paul Dooley, Edel Fox and Padraig McGovern many of whom have joined Scoil Acla as tutors over the years. Scoil Acla Summer School 2019 runs from July 27th to August 3rd and online bookings will open soon. For more information please visit www.scoilacla.ie, email info@scoilacla.ie or phone us on 085 881 9548. Don’t forget to keep up-to-date with us on Facebook, Twitter & Instagram!